Elephants are highly sociable animals and have a very complex and well developed communication system. 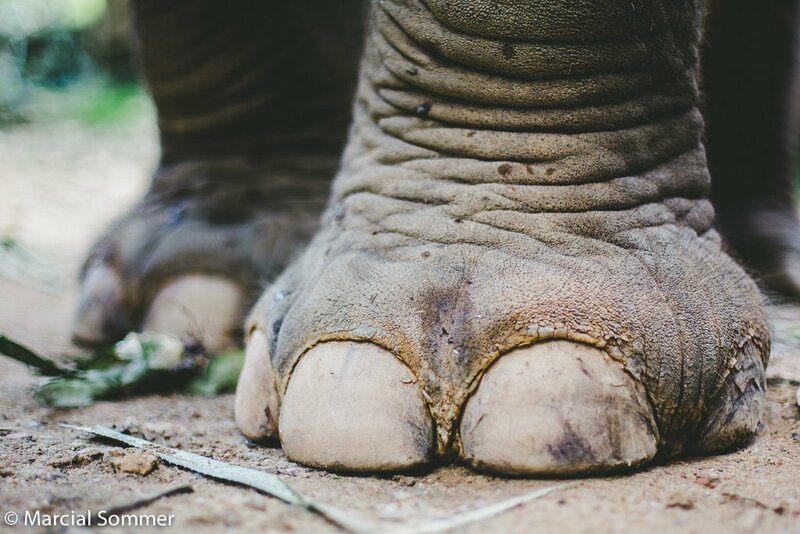 Visitors to Phang Nga Elephant Park can see many subtle movements and behaviours that at first sight may not seem to have much meaning, but they do! 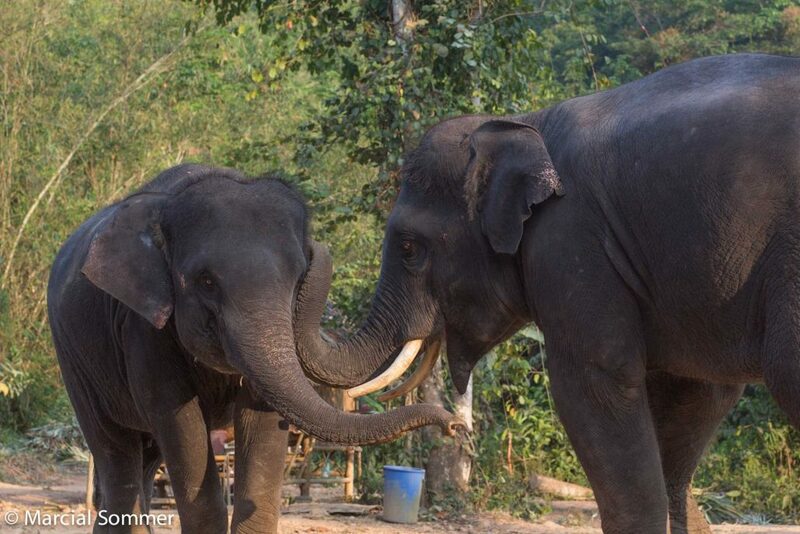 Elephants communication uses all of the senses – touch, sight, smell and hearing. In addition, elephants have an amazing ability also to detect vibrations. Like all mammals, elephants show physiological information (this is needed for mating, to assess body condition, for identification etc. ), emotions (fear, anger, excitement, playfulness etc.) as well as specific intentions and desires (“time to go to the waterhole, girls!”). 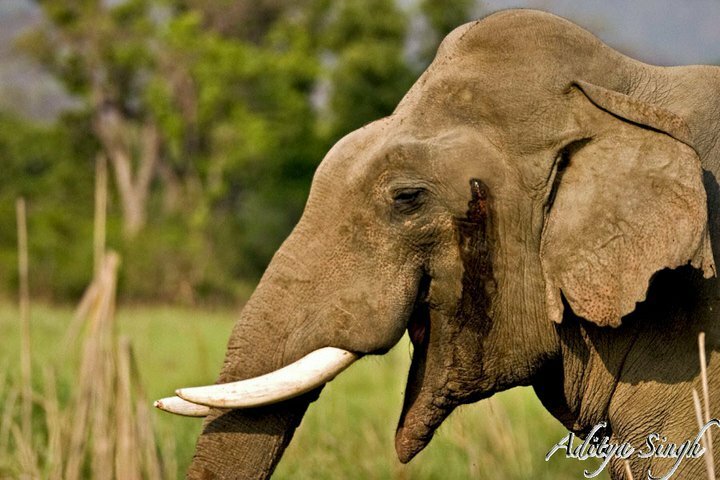 At Phang Nga Elephant Park, we try to offer insights and education on the wonderful subject of the Asian elephant. So, let’s go a bit more in depth into this question of communication in our pachyderms and illustrate with examples. Elephants are able to produce a wide array of sounds from rumbles to roars, cries, barks and trumpets, and a lot more in between. By far the most used vocal sound by elephant is the rumble. Click here to listen to some rumble sounds. The sounds range from very gentle low frequency rumbles as low as 12 Hertz (in comparison – a typical female human’s voice fluctuates at around 220 Hz), to as high as 470 Hz when roaring. Roars can reach 112 Decibels, which is almost as loud as a jet taking off! Elephants can produce such a wide array of frequencies by lengthening and shortening their vocal cords. Depending on the position of the trunk and the speed and duration of air moving through it, elephants can produce high frequency trumpeting sounds which are also called trunk calls. Click here to listen to some trumpeting. 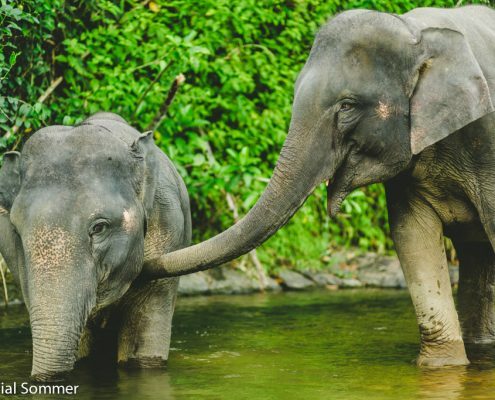 National Geographic published a fascinating article with wonderful audio examples describing the meaning of elephant calls. Click here to read that article. 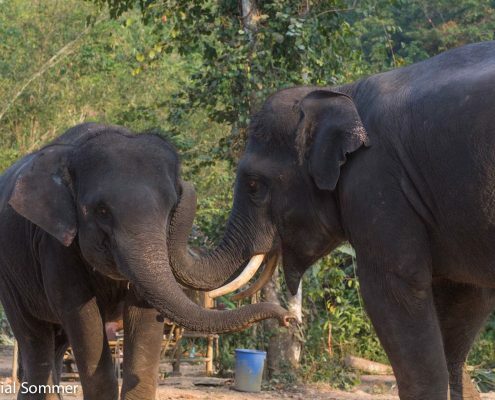 Visual or nonverbal communication is as important for elephants as it is for humans. 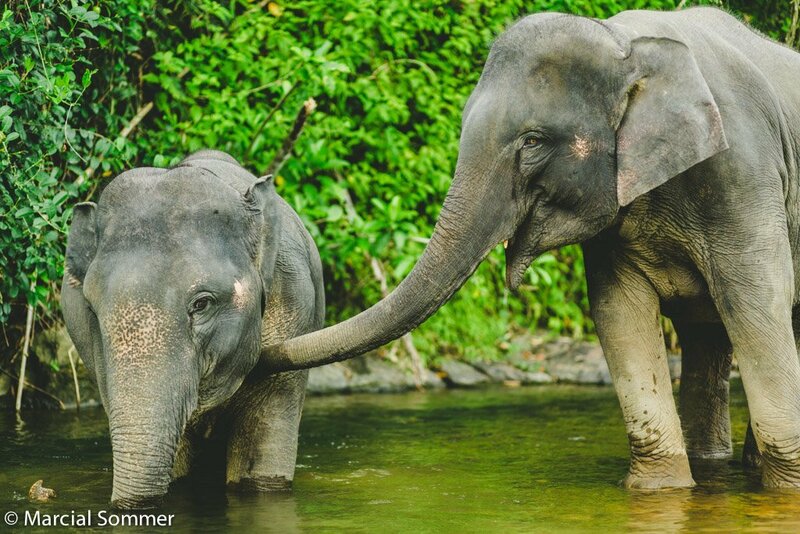 They use their heads, eyes, mouth, ears, tusks, trunk, tail, feet and even their whole body to signal messages to one another. An angry elephant, for example, can be seen flapping its ears, kicking up dust, tossing its trunk and even charging. When threatened or trying to show dominance, an elephant will endeavour to appear larger by carrying its head high and spreading its ears. A socially excited elephant widens the eyes and rapidly flaps the ears, but a frightened elephant raises the tail and chin. 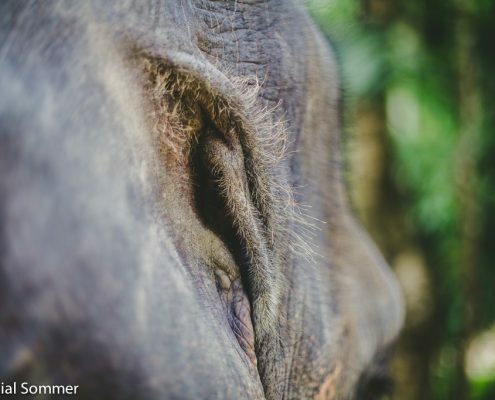 It takes a lifetime to get to know and fully understand the subtleties of an elephant’s visual communication system, as many signals are used for multiple purposes. Click here to see a very comprehensive Elephant Gestures Database compiled by Elephant Voices. The sense of smell (olfaction) is very pronounced in elephants and they use it constantly to make sense of their environment. In fact, elephants are believed to have the most effective olfactory system in the animal kingdom. When trying to understand where an elephant’s attention is don’t try to analyse the gaze (as we humans do) but watch carefully the tip of the trunk and you will see it is constantly moving and taking in new smells and aromas. The elephant’s trunk is a fusion of the nose and upper lip. They have some 2,000 genes dedicated to scent compared to 800 or so in dogs and a puny 400 in humans. 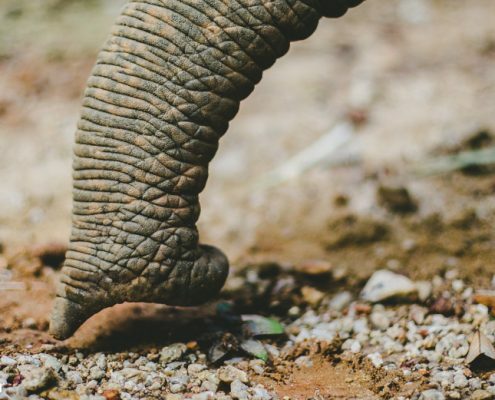 Click here to find out more about olfaction in elephants. But what do elephants pick up with their sensitive nose? They sniff everything – food, animals, urine, faeces, saliva and secretions from other elephants’ temporal glands (that open on the head between the elephant’s ears and eyes). One African elephant gave a loud call after being presented with urine soaked soil from her daughter who had been separated from the herd for some days. It has also been shown that elephants can use their sense of smell to keep track of the location of different individuals. It may also, at least in part, account for the famous memory of the elephant. Interestingly, scientists have found that elephants classify human ethnic groups through their sense of smell. In one experiment elephants ran further and stayed alert for longer when presented with people wearing T-shirts worn by members of an ethnic groups that represented a bigger level of threat. And then there is the musth. Musth is a Persian word that is used to describe a dramatic change in behaviour in male elephants that lasts from weeks to months at a time. It is characterised by aggression, sometimes very unpredictable and dangerous, and is accompanied by a large rise in the animal’s reproductive hormone, testosterone levels (up to 60 times greater than in the same elephant at other times). This is the reason adult male elephants should be kept separate from the females and treated with a lot of respect. Nobody really knows the purpose of the musth but a lot is written about the marking of territory and the expelling of other bulls from an area. However, it has been reported that older females allow mating with an elephant in musth, recognised by the smell of the secretion of the temporal glands. Interestingly, female elephants also secret a thick fluid from their temporal glands when in heat, but fortunately do not show aggression like the bulls. 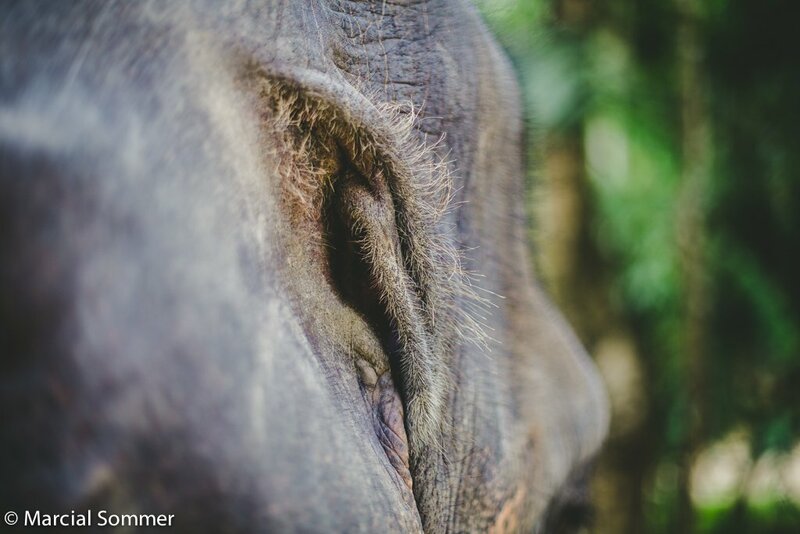 Click here for an image of a male Asian elephant in musth with the temporal gland secretions pouring down his cheek. 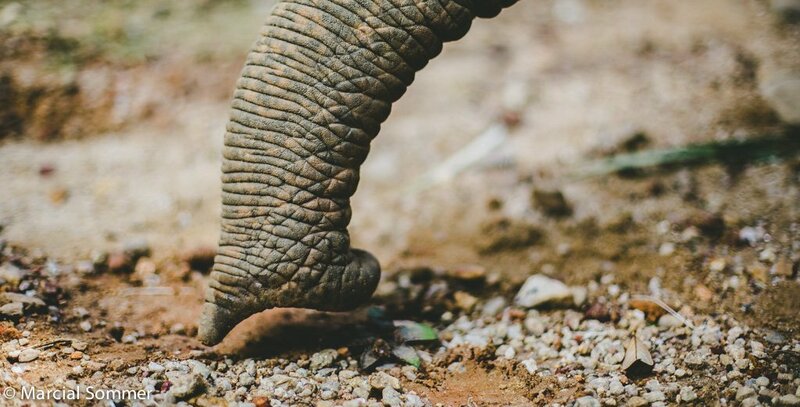 The Elephant Gesture Database has some fascinating images and lots more interesting and important information on how elephants use their sense of smell click here. 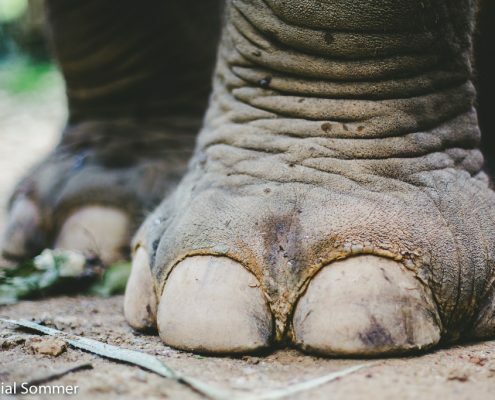 As incredible as it sounds, elephants can actually feel the vibrations of other individual elephant’s vocalisation through their feet. Seismic energy transmits most effectively between 10 and 40 Hz, and as we have seen, the very deep rumbles elephants make are within this Hertz range. These sounds travel through the grounds as well as the air! 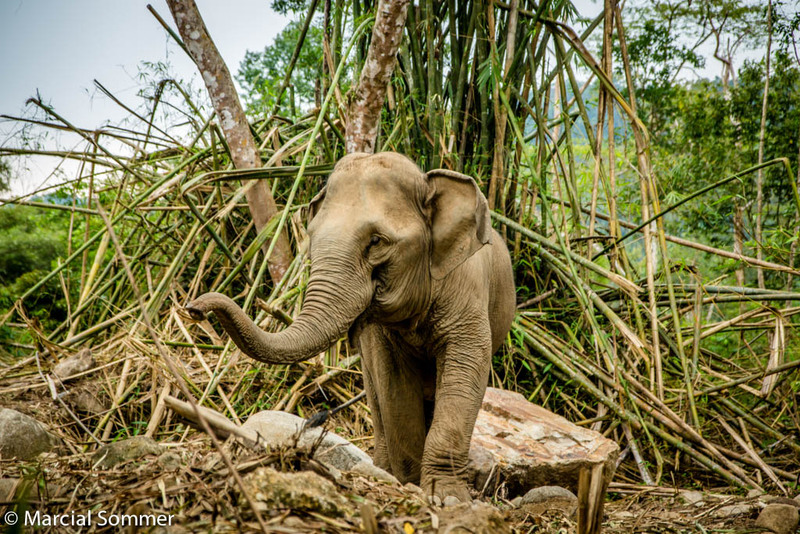 So, as well as via its ears, the elephant picks up the ‘noise’ by bone conduction (the ground vibrations travel directly from its front feet through its leg and shoulder bones and on to its skull and middle ear). They can even interpret the message being sent in this way. 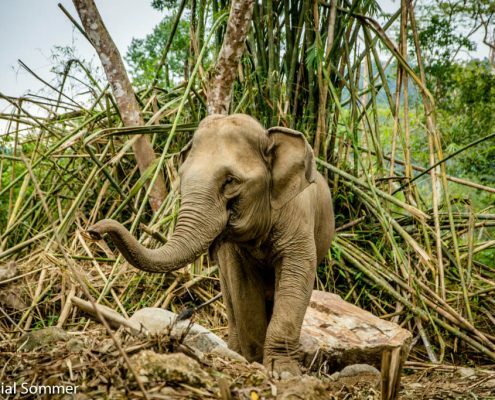 Researchers took a recording of an elephant warning call, cut off all the high frequencies and played the sound (inaudible to human ears) to an elephant herd. The reaction was similar to when a herd would actually receive a warning call; they became very cautious and rapidly left the scene. In another experiment, researchers with a seismic speaker played back the call of a female in heat to a bull in heat as well. He started searching and walked right past the bush where the device was hidden, showing that not only can elephants detect the seismic waves though the ground, they also know where it is coming from! Click here for a fascinating Ted Talk that describes those experiments. It’s really amazing to see the footage of elephants freezing their motion to listen with their feet.